Samuel Langhorne Clemens, who later took the pen name Mark Twain, has several ties to West Point, Iowa. Mark Twain is, of course, a unique figure in American literature who looms above all others as the most widely quoted and recognized. He is always envisioned as the quintessential American writer. He is like no other American literary figure in that his name alone brings to mind images and issues that are at the heart of 19th century American cultural history. School children in London, Berlin, and Moscow are familiar with his stories. Sam Clemens was born on November 30, 1835 in Florida, Missouri. His parents were John Marshall and Jane Lampton Clemens. Most of Sam’s childhood years, the inspiration for many of his later writings, were spent in Hannibal. As a young man in the 1850s, he worked for his brother, Orion, in Muscatine and Keokuk. Orion was in the newspaper and print shop businesses. Sam did not write under the name Mark Twain until the 1860s when he was living in Nevada. For that reason, I will generally refer to him as Sam Clemens, and not Mark Twain, in this article. The key to understanding all of Sam Clemens’ ties to West Point, Iowa is the extended family in which he grew up. Clemens’ parents were members of a cohesive group of families with ancestors in England and Ireland. In the late 1700s and early 1800s, these family groups often lived and moved together in order to provide financial support and protection from the Indians and other dangerous elements. These extended families were like communities unto themselves, and marriages among cousins were not uncommon. The families with which Sam’s parents were connected included the Walkers, Pattersons, Caseys, Montgomerys, Creels, Stotts, and Taylors. These people showed an intense love of the frontier, and followed it westward as the country grew. By the mid-1700s, they found their way to a large Scotch-Irish “colony” in Rockbridge County, Virginia. That is in the mountainous west central part of the state. After settlement opened up in Kentucky, they moved to Adair County and spent more than a generation there. When even Kentucky became a little too crowded for their liking, the families again became restless for the frontier. The question became where they would land next. In the 1830s, attitudes toward slavery often determined the western destinations of the pioneers. Slaveholders generally chose Missouri, and emancipators chose Illinois or Iowa. Sam’s parents ended up in northeastern Missouri. Most other families in the group, however, moved from Adair County to Irish Grove, then in Sangamon County (now Menard County), Illinois. By 1835, this main group formed the opinion that Irish Grove was not a healthy place to live due to chronic, widespread illness within the community. It was well known that part of what is now Iowa had been opened to settlement. The group sent several men, including William Patterson and Hawkins Taylor, to scout for a new home west of the Mississippi. These men crossed the Mississippi at Fort Madison and continued on to the present site of West Point, which was occupied by a few rough buildings. The town site made a favorable impression on the group, and they moved their families from Irish Grove to West Point. One of the individuals who made the move was Sam Clemens’ great grandmother. The most commonly known tie between Samuel Clemens and West Point is his great grandmother, Erythusa Jane Montgomery Casey. She was not only a blood relative, but the matriarch of the extended family that eventually reached southeast Iowa. Born in Virginia in 1761, Jane Montgomery and her parents and siblings moved to Kentucky in 1779. In spring 1781, only 20 years old, she helped defend their wilderness settlement of four cabins against the Indians. Her father, William, was killed as he left their cabin in the morning. Her brother, John, was killed at a neighboring cabin. Young Jane barred the door of her father’s cabin and held the Indians at bay with a rifle. She sent her 12-year old sister up the chimney and out the back of the house to fetch help. Jane Montgomery married William Casey, a Revolutionary War veteran, in the following year. The Caseys had come separately from Virginia. After their marriage, there were three occasions on which Jane again held a rifle to defend their home against the Indians. Mr. and Mrs. Casey were the most revered couple in their community in Adair County. Col. Casey later had a county in central Kentucky named for him. One of their daughters, Margaret (or “Peggy”), married Benjamin Lampton. The Lamptons’ daughter, Jane, was Sam Clemens’ mother. Jane Lampton Clemens was named for her grandmother, and was born in her grandmother’s home in Kentucky. An unknown artist painted Jane Montgomery Casey in 1811, when she was 50 years old. She appears to have worn a dark dress, or frock, and the light blouse underneath has a rounded collar. Her left arm is draped casually on a chair or couch. Her hair was severely knotted under a black lace cap. In the portrait, she looks directly at the artist. Here eyes were said to have been violet blue. It was a constant struggle to feed and clothe her children in frontier Kentucky. If a doctor was unavailable, she served as a nurse both to her own family and others. As the matriarch of her family, Mrs. Casey often called not only her own children but her grandchildren to her parlor to counsel them. In the early 1830s Mrs. Casey, by this time a widow, moved with her son, Green, to Irish Grove, Illinois. The fertile, inexpensive land there was a step up from the poor, hilly soil of southern Kentucky. Various members of Mrs. Casey’s extended family (the Walkers, Pattersons, Stotts, Taylors, and others) moved to Illinois about the same time. Others, including the John Marshall Clemens family, moved to northeastern Missouri. Mrs. Casey’s husband had owned slaves in Kentucky, but she had none after she left the state. John Clemens continued to own slaves in Missouri. Great-grandmother Casey came to West Point in 1837. That was after Green Casey, her son, had scouted the area with William Patterson and Hawkins Taylor in anticipation of moving there. Green stayed in Illinois and died shortly thereafter. His widow, Jane Patterson Casey, is believed to have lived near the northwestern corner of West Point’s town square. Great grandma Casey is assumed to have lived with her. Sam Clemens, soon to be the most famous of his great grandmother’s descendants, was born two years before she reached West Point. Shortly after her arrival, Mrs. Casey received a letter from Sam’s mother about the new and larger dwelling into which she had moved her growing family in Missouri. Granny Casey mistakenly envisioned two full stories connected by a graceful flight of stairs. The actual house was much more modest. Mrs. Casey no doubt invited Jane Lampton Clemens, Sam’s mother, to visit her at West Point. Jane Clemens would no doubt have been highly motivated to visit her grandmother because of their close relationship in Kentucky. If she did visit West Point, however, it is not documented. Jane Montgomery Casey died at West Point on January 30, 1844. She was 83. She lies beneath a simple gray stone in West Point’s City Cemetery. Sam Clemens was eight years old at the time of her death. It is not known if he attended the funeral with his mother. The winter trip would have been difficult. If his mother did not want to endure the hardship, she and perhaps Sam may have visited West Point the next spring or summer. Sam would also have had opportunities to visit his great-grandmother’s grave when he moved to Iowa at a later age. Mary Eleanor “Mollie” Stotts of Keokuk, a “master spirit,” married Sam’s brother, Orion, on December 19, 1854 at her home. As a child, she had lived in West Point before moving to Keokuk. Her father, William, succeeded Hawkins Taylor as Lee County Sheriff. Mollie’s mother, Mary Patterson Stotts, had been a girlhood friend of Jane Lampton in Kentucky. Mary Stotts was also a sister of Col. William S. Patterson, a co-founder of West Point. So William Patterson was an uncle of Mollie Stotts Clemens. In July 1855, at age 19, Sam took a boat from Hannibal to Keokuk. His brother, Orion, owned the Ben Franklin Book and Job Office downtown. Orion offered Sam work on his largest project to date--publication of the Keokuk City Directory. The printing office was on the third floor of a four-floor red brick building on Main Street. There was a book store on the ground floor and a music school run by Professor Isbell on the second floor. Sam earned $5 a week and free board at Ivins House, the town’s best hotel. After his work was finished, Sam would sometimes play the guitar or banjo, and sing comic and nonsense songs in the print office. Orion and his other apprentices would join in. Professor Isbell, hearing the ruckus, invited Sam and his comrades to join a singing class. His high spirits, instinctive gallantry, and dancing skills made him popular. Through Orion’s wife, Mollie, who was close to Sam’s age, and her younger sister, Belle, he met a bevy of girls. In letters, he mentioned his favorites including Ella Patterson and Ella Creel, his own cousin. But it was one of Orion’s neighbors, “the talented and brilliant” Ann Elizabeth Taylor, who was his primary interest. Ann was the daughter of Hawkins Taylor, a co-founder of West Point and later a Keokuk alderman. She was born on January 9, 1840, when the family resided in West Point. The Taylors’ home was within a block of the Stotts family, with whom Orion Clemens lived during most of 1856, and in the same neighborhood as the Creels and Pattersons. Sam had intimate friends in both families. There is also some evidence that the Taylors entertained Sam at their summer property north of Keokuk on the Mississippi. Annie Taylor was well read, musical, liked to draw, and shared Sam’s ability to see the comical side of things. She was something of a rebel, too, having “very irregular” attendance at prayer meetings. She also had ambitions beyond marriage, and was attending Iowa Wesleyan College in Mt. Pleasant. Sam’s younger brother, Henry, who also worked at Orion’s print shop, was taken with Annie’s younger sister, Mary Jane. Sam courted Annie down the locust-lined streets of Keokuk during her school holidays. When apart, they corresponded regularly. Her letters were described as “strikingly original and humorous.” They inspired Sam to write about subjects he knew she, above all others, would appreciate. One of his letters to “My Dear Friend Annie” was about the swarms of bugs attracted by the gas light as he worked late in the printing office at 2 a.m. He imagined a big “president” beetle first buzzing at his flock of lesser insects, and then joining them in church hymns. The letter demonstrated his ability to write an entertaining and detailed story about the commonplace. Annie once wrote Sam from Iowa Wesleyan about the difficulty of composing a paper. He responded “Ah, Annie, I have a slight horror of writing essays myself. And if I were inclined to write one, I should be afraid to do it, knowing you could do it so much better…” She sent him a drawing of Mt. Pleasant, which he jokingly referred to as “Mt. Unpleasant,” probably because her college attendance kept them apart. What is unmistakable in Sam’s letters is his tenderness for Annie Taylor. When there was a drought in her correspondence, he gently chided her in an attempt to renew the exchanges. For a time, Sam’s mother was concerned that he was headed for marriage while still a pauper. But his restless spirit caused him to leave Keokuk after a year and a half. He continued to write his dear friend for a time, but distance caused the relationship to fade. After attending Iowa Wesleyan for two terms, Annie completed her studies in art and literature at Lindenwood College in St. Charles, Missouri. She was an English instructor there for several years. That was an outstanding accomplishment for a young woman at the time. Annie married Frederick Cunningham, a local man who became postmaster in St. Charles. The two moved to California, where Frederick’s health failed and he died. Annie came back to the Midwest, marrying Charles A. Cunningham (possibly a relative of Frederick) and setting up a new household in Carrollton, Missouri. The two had no children of their own, but Ann served as a de facto mother to three whom she had educated. During their years in Carrollton, Charles became a judge of the probate court. Ann, however, fell into poor health after age 35. It was said that, in her own home, she was cheerful and a charming conversationalist. However, she was unable to take part in any social life in the town during the last 20 years of her life. Ann died of pneumonia on January 23, 1916. Her friendship with Sam Clemens had been fleeting and preceded his literary fame. Still, this one-time resident of West Point thought enough of Sam to save his letters in a Japanese-style lacquer box for 60 years. Col. William S. Patterson was a key member of the extended family. He was a founding member of the Presbyterian Church in West Point and was elected to the first territorial legislature. He was familiar with the Sauk chief, Black Hawk, who lived for a time about eight miles south of West Point. After moving to Keokuk in the 1840s, Patterson owned a hotel and pork packing plant. He was also a leading political figure there, serving three times as mayor. He kept a watchful eye over not only his immediate family, but distant relatives and acquaintances. Patterson made a significant loan to Orion Clemens, who always found it difficult to run his printing business profitably. Sam referred to the loan in a letter he sent to Orion from St. Louis. “Now, as I understand the house business, you can get a big, reputable house to live in for $110 per year—which is cheap enough rent…You owe uncle Billy Patterson and old Jimmy Clemens, Jr. (a wealthy relative) money—and if they were to die, their administrators would “gobble up” everything you’ve got. Therefore, put no property in your own name.” Uncle Billy Patterson was 58 years old at the time. The title character’s name for Mark Twain’s famous novel, Tom Sawyer, may have been inspired by a one-time resident of the West Point area. A pen name, Thomas Jefferson Snodgrass, used by Sam Clemens in the Keokuk Post between October 1856 and March 1857, may have been similarly inspired. Ann Stroupe and Jim Ramsey, descendants of Thomas Sawyer and his wife, Eliza Snodgrass, provide considerable support for these beliefs. Thomas Sawyer was a resident of Lee County from 1850 to 1892, first owning property in Pleasant Ridge Township. Like the Caseys, Pattersons, and Taylors before him, he became a member of the Presbyterian Church in West Point. He was elected to the Iowa Legislature in 1856, during the time Sam Clemens lived in Keokuk. Being close to the newspaper and printing businesses and interested in politics, Sam Clemens would have been aware of his campaign. In his legislative position, Sawyer succeeded R.P. Creel and was followed by J.A. Casey, both members of the “extended family” of Sam Clemens. Eliza Snodgrass was Thomas Sawyer’s wife. She had a brother named George Washington Snodgrass. The similarity to the pen name, Thomas Jefferson Snodgrass, may not be a coincidence. Eliza’s parents lived in West Point from 1850 until their deaths in 1860 and 1877. They are buried in West Point Cemetery close to the grave of Sam Clemens’ great-grandmother. Thomas Sawyer was the executor of his mother-in-law’s will, and spent considerable time in West Point working on her estate. It is known that the Casey, Creel, and Snodgrass families knew each other from church activities. If Sam Clemens visited his great-grandmother’s grave in West Point, he may have been introduced to Thomas and Eliza Sawyer at church or a relative’s home. William Patterson, a member of the extended family and active in Keokuk politics, may also have made the introduction during Sawyer’s campaign. In any case, it is very likely that Clemens knew the Sawyers or at least knew of them. After leaving Keokuk in 1857, Clemens returned several times in the 1860s and 1870s. He started writing Tom Sawyer in April 1874 and published it in 1876. Thomas and Eliza Sawyer moved to Keokuk in 1882 and lived there the rest of their lives. It would be wonderful to say that Mark Twain was related to the Clemens family that has been in West Point since the 1850s. But if there is any relation, it must be very distant. 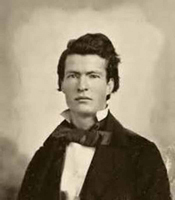 Sam Clemens’ immigrant ancestors came from England, while the West Point family’s ancestors were from Germany. Georgia Kress Clemens, the widow of Maurice Clemens, has spent considerable time researching the family history and looking for a connection. The patriarch of the West Point Clemens family was Joseph (1820-92). He married Catharina Gerardi (1823-98) in St. Louis in 1848. Both were born in western Germany. Joseph, a veteran of the Mexican War, moved his family from St. Louis to West Point around 1857. One family researcher speculates he may have been given a land grant in Iowa due to his military service. He was a brick mason by trade. The English family members spelled their name “Clement” or “Clements” before the 1800s. Sam’s lineage can be traced back to his paternal grandfather, also named Samuel, but it gets a little fuzzy beyond that. Grandpa Clemens died in a tragic construction accident at a young age. Apparently, he had shared little information about his ancestry prior to his death. Is it still possible the West Point Clemens family is related to Mark Twain despite ancestors coming from two different countries? The Clemens name is found throughout England and Germany in various forms, including Klemenz in the latter country. Many of the early settlers of England came from Germanic countries. (That is why English is, at its core, a Germanic language.) So it is possible there was some link between Sam Clemens and Joseph Clemens. But it would probably have been a weak link. Whatever the case, West Point is very fortunate to have this strong a connection to one of the greatest American writers.